I joined Kermans in August of 2010 having 12 years experience in the field of Property Management. I enjoy meeting new people, working and communicating with customers out in the field, and problem resolution. I value the Kerman’s dedication to servicing the customer and their emphasis on teamwork. My time away from Kermans is spent with family and my dogs and cat. I also enjoy making crafts especially jewelry and working with pottery. Most of all I really like to travel the world. 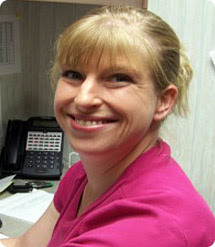 Sarah is an important part of the Kermans Advantage – unparalleled service and knowledge backs up every sale. Whether you are carpeting a mansion in Carmel or looking for an area rug for your first home in Fishers, you’ll experience the same attention, care and exceptional result. Learn more about Kermans.